The latest generation of laser-lit projectors delivers much enhanced brightness at 6,500 lumens, making laser projection a reality for the largest halls, galleries and live event venues. The Panasonic RZ670 surprises with a rating of ANSI 6,500lm providing natural pure white at a duv value of just 0.006 – just ¼ the duv value of lamp-lit competitors. Supplementing this the Quartet Colour Harmoniser (Colour Wheel plus Phospor Wheel) ensures exceptional clarity right through the BGYR spectrum. Uniquely the Panasonic RZ670 uses a four colour wheel, with white created by combination of the four colours. Supplied by A to V flight cased with flying frame & power options. 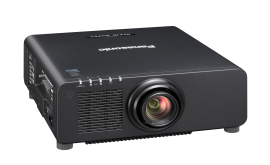 This projector also boasts stunning 3D projection capabilities, offering both passive and active 3D projection system compatibility for the viewing of 3D images. Combined with the additional standard features, expanded lens suite, the Christie M Series provides high performance and peace of mind for all users. 9,400 ANSI Lumen projector powered by the acclaimed SOLID SHINE Laser drive and latest 1-Chip DLP™ technology, these projectors exceed expectations with dependable 24/7 operation.